One of these has been named “the Stone House”, because it was built from real stones. “The Stone House” is ideally suited for a bigger group of guests. There are two bedrooms on its attic floor; each of which sleeps four. The guesthouse also contains a large reception room and kitchen, shower, sauna and an expansive terrace with a view of Lake Zvirgzdu. A swimming spot with a plank-way and boat dock is located 50 metres from “the Stone House”. Another swimming spot is located a little further away. Clean and sandy water beds mean that both Lake Zvirgzdu swimming spots are perfect for taking a cool dip on a hot summer day. You can park your car right next to the guesthouse itself. You’ll also find a campfire spot and barbeque grill right next to the house. The stairs to the attic floor and bedrooms are located on the outside of the house. Skylights mean that both bedrooms are light and welcoming. One bedroom is decorated in salmon tones, whereas the walls of the other bedroom are salad green. Early risers will be woken by the first rays of the morning sun via the eastward facing balcony adjoining the bedrooms. Guests will also find shower and toilet facilities outside their bedrooms on the attic floor. The guesthouse atmosphere is very hospitable; rates are affordable and are set depending on the number of guests staying at the guesthouse. The sauna in “The Stone House” is ideal for bigger groups of guests and has spacious shower facilities and a large sauna that is easy to heat. There is a special room in the sauna where bathers can flay one another with birch brushes. Once heated, this room remains hot for a long time. Skilful use of the sauna will result in a truly invigorating sauna experience. However, if you prefer, you can hire the services of a local sauna attendant who will preside over your visit to the sauna and make sure that you enjoy all the benefits to be enjoyed from a truly professional sauna ritual. And for guests looking to cool off after letting off steam in the sauna, this guesthouse is the closest to Lake Zvirgzdu. The rate on Fridays, Saturdays and Sundays for the whole guesthouse (four people), including the sauna is Ls 80. On weekdays the rate is Ls 60. If you only use the bedrooms on the top floor without the sauna, the rate per room with sleeping accommodation for four people is Ls 25. The room rate includes use of the shower and toilet facilities, as well as bed linen and towels. 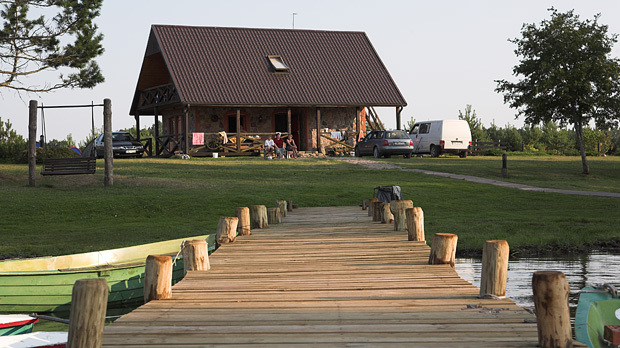 For longer stays, guests can reach a friendly agreement with the landlady of the Ezermaļi campsite.